SIS LIVE, Europe’s largest outsidebroadcast and satellite uplink supplier in the broadcast market, has signed an exclusive reseller and development agreement with Astrium, an EADS company and one of the biggest suppliers of civil and defence space systems and services in the world. Under the terms of the deal, SIS LIVE is to use its inhouse development and manufacturing facilities to complement Astrium’s existing development programmes. The first product being developed by SIS LIVE for Astrium is the world’s first fullyautomated flat plate antenna system. SIS LIVE’s inhouse design and manufacturing operations are responsible for creating a number of cuttingedge atellite uplinking systems, including the uPod portable uplinking system and the brand new uPak fullyautomated flat panel antenna system. SIS LIVE will continue to be responsible for the development of both products and will concentrate on the broadcast market, whilst Astrium will continue to focus on the military, government and other markets. uPod is the ultimate portable uplink system that packs into easy to carry,flyaway cases, each weighing less than 23kg, offering a totally integrated uplinking system, with its own bookings system and dedicated satellite capacity. At the same time, it’s incredibly easy to operate, even for novices. There are four models to choose from — with antenna sizes of 0.75, 1.0, 1.2 and 1.5 metres. uPak is a compact, fully automated flat plate VSAT terminal that provides highspeed data communications for internet connectivity, video transmission and VPN connectivity. With single button operation, the unit can be used by anyone with little or no training. uPak is lightweight and extremely portable, designed to be easily transported for remote field operations. Initially, the uPak will operate in Kuband, but the range is being extended to also offer Kaband and Xband versions. 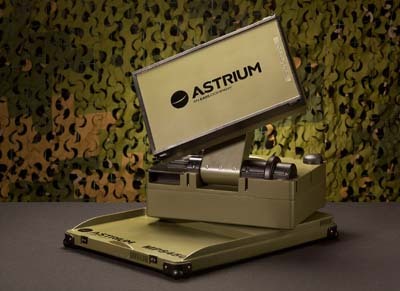 Both products will become part of Astrium’s MobilePatrol product family. Based upon the uPak, Astrium launched the MobilePatrol MPS450 during Global MilSatCom in London on the 9 th November. The terminal attracted great interest and enthusiasm, due to its low weight, size, competitive pricing, innovation and single button operation About SIS SIS is one of the world’s leading companies in the television broadcasting industry. It is the foremost supplier of television programming and data services to the UK and Ireland betting industry. The company’s broadcast business, SIS LIVE, has the largest satellite uplink fleet in Europe and is the largest outside broadcast provider in the UK. It offers a complete broadcasting solution from onsite outside broadcast facilities through to global distribution and IP provision. The company covers 100,000 hours of live events worldwide each year and credits include The Commonwealth Games, Formula One, Wimbledon Championships and European Tour Golf, and delivers approximately 80% of live news feeds across the UK.